I hope you had some time over the last couple of weeks to think about some big dreams you would like to make reality. While visiting Southern Door & Plywood a few weeks ago, Kevin Elswick told me about one such dream of his father’s that was definitely share worthy. Take some time and view some of the 715 pictures his father took on his epic bicycle adventure from Virginia to Washington State. I hope his story inspires you to get up and get moving in 2013! Click on the link below, then click on the picture to view more pics. My name is Larry, and I live in Jacksonville, Florida. I’ll be 61 this year (2005) and I’m recently retired. I retired early so that I could do some of the things that I’ve always wanted to do but never had the time. 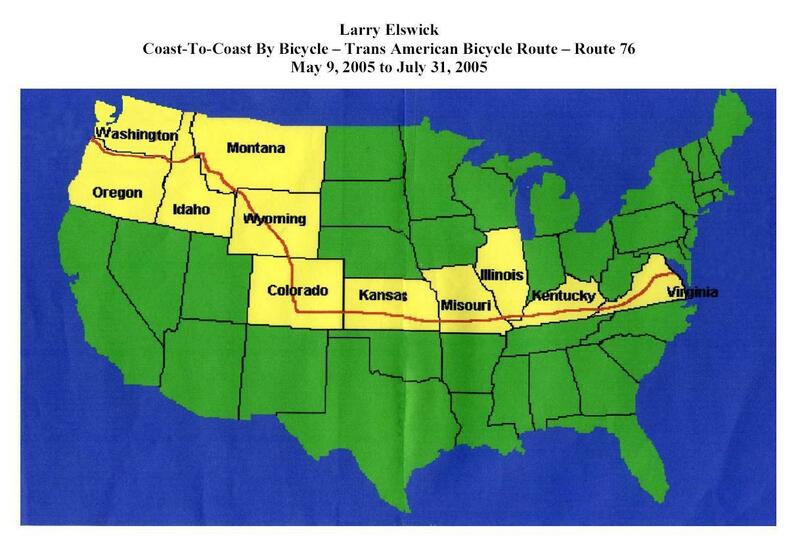 One of them is riding my bicycle across the United States. And that is what I’m getting ready to do during the spring/summer of 2005.